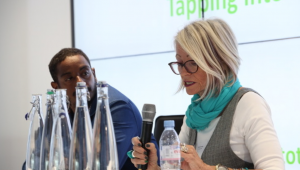 As a member of The Corbett Network it was an honour for Dabs and Fran to be invited to speak at their inaugural landmark event “Tap into New Talent” – a conference spearheaded by The Corbett Network, Nacro and Dominic Headley Associates (DHA) employer, underlining the importance and value to employers of hiring people with convictions within their workforce. 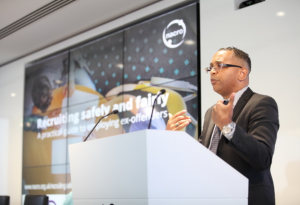 Employers from a diverse range of sectors throughout the UK attended to hear first hand the real benefits and the positive effect it has on their companies. 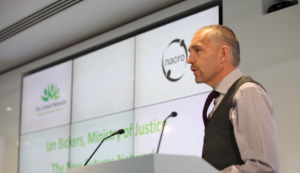 The audience also comprised of key policy makers from various government departments including Ian Bickers, lead of theMoJ’s Education and Employment Strategy who introduced the audience to the New Futures Network, which aims to increase the number of employers working in partnership with prisons and ensure that the education and training delivered in custody will improve job opportunities upon release. The conference, hosted by Eversheds Sutherland, featured an expert panel of senior executives representing organisations that employ people with convictions, including: Alasdair Jackson, CSR and Sustainability Director, Recycling Lives, Kathryn Nethersole, Property Project Manager, Tideway, Geoff Webb, Operations Lead, Millmoll Ltd and Kelly Carrell, Co-Founder, Census Group. These employers outlined their positive experiences of the hardworking and loyal staff they regularly take on that consistently add real value and productivity to their workforce. In addition to ourselves other Corbett Network members that deliver training and support programmes for people with convictions included David Apparicio, CEO, The Chrysalis Foundation and Jane Gould, CEO, Clean Sheet who all brought in people they have supported to speak openly about their moving stories and help to re join society.